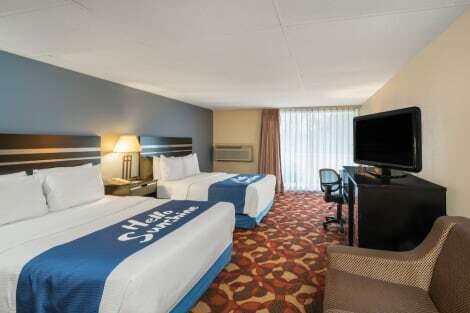 Just a short drive from a variety of attractions and activities, the Motel 6 in Carlisle, Pennsylvania offers convenient services and amenities for a comfortable stay. Motel 6 Harrisburg - Carlisle is less than 20 miles from the Ski Roundtop, which offers skiing, snowboarding, snow tubing, paintball and a rope challenge course. Carlisle Fairgrounds and Whitaker Center for Science are just minutes away. The pet-friendly Carlisle Motel 6 features amenities such as an outdoor swimming pool, coin laundry facilities and free morning coffee. The guestrooms boast services including free local calls and extended cable TV. Make yourself at home in one of the 60 air-conditioned rooms featuring refrigerators and microwaves. Complimentary wireless Internet access keeps you connected, and cable programming is available for your entertainment. Bathrooms have shower/tub combinations and hair dryers. Conveniences include safes and desks, and you can also request cribs/infant beds (surcharge). With a stay at Days Inn by Wyndham Carlisle North, you'll be centrally located in Carlisle, within a 15-minute drive of Carlisle Fairgrounds and Sports Emporium. This hotel is 3.3 mi (5.3 km) from Army Heritage and Education Center and 4.1 mi (6.6 km) from Carlisle Barracks. Featured amenities include wired Internet access (surcharge), a 24-hour business center, and a 24-hour front desk. Free self parking is available onsite. With a stay at Best Western Carlisle in Carlisle, you'll be within a 10-minute drive of Carlisle Fairgrounds and Sports Emporium. This hotel is 2.2 mi (3.5 km) from Army Heritage and Education Center and 2.9 mi (4.7 km) from Cumberland County Courthouse. Don't miss out on the many recreational opportunities, including an indoor pool, a spa tub, and a fitness center. Additional features at this hotel include complimentary wireless Internet access and a vending machine. lastminute.com has a fantastic range of hotels in Carlisle, with everything from cheap hotels to luxurious five star accommodation available. We like to live up to our last minute name so remember you can book any one of our excellent Carlisle hotels up until midnight and stay the same night.